GABA (Gamma Aminobutyric Acid) is a non-protein amino acid that functions as a neurotransmitter in the human brain. 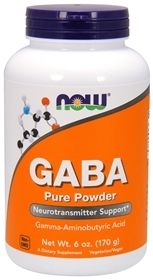 GABA is known as the brain's own calming agent and is naturally produced in the body. By inhibiting over-stimulation of the brain, GABA may help promote relaxation and ease nervous tension. NOW provides only the naturally occurring form as found in food and in the body. Delicious orange flavor NOW Chewable GABA combines this naturally occurring neurotransmitter with the amino acids Taurine and Theanine for their synergistic effects. Research shows that GABA might play a key role in protecting against depression and anxiety. One study published in the journal Biological Psychiatry in 2010 indicates that people with major depression may be more likely to have low levels of GABA, and the researchers found that increasing GABA levels is helpful in the treatment of anxiety. GABA is an inhibitor found in the brain that limits the creation of too many chemicals that may cause overexcitement by blocking certain brain signals known as neurotransmissions. A deficiency or abundance of these chemicals can lead to serious problems such as restlessness, irritability, insomnia, seizures, and spontaneous body movements (twitching). Other neurotransmitters like adrenaline, dopamine and serotonin, have an excitatory function, where GABA has an inhibitory function, slowing down neurons from firing. This preventing of neurons from firing forces the brain to calm down, causing relaxation. It has been helpful for stopping panic attacks, anxiety and depression. It is a very effective sleep aid, and has been helpful for better concentration. If you can't sleep at night, especially if you have a busy mind and can not stop thinking at bedtime, give GABA a try.